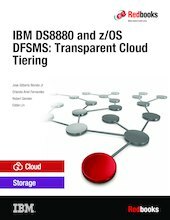 This IBM® Redbooks® publication gives a broad understanding of storage clouds and the initial functionality that was introduced for mainframes to have Transparent Cloud Tiering. A gateway in the DS8880, which allows the movement of data to and from Object Storage be using a network connection. DFSMShsm enhancements to support Migrate and Recall functions to and from the Object Storage. Other commands were enhanced to monitor and report on the new functionality. DFSMShsm uses the Web Enablement toolkit for z/OS to create and access the metadata for specific clouds, containers, and objects. DFSMSdss enhancements to provide some basic backup and restore functions to and from the cloud. Part 1 provides you with an introduction to clouds. You might be new to clouds or have a confused view of cloud terminology. If so, Part 1 is helpful in providing you with the basic knowledge you need. Part 2 shows you how we set up the Transparent Cloud Tiering in a controlled laboratory and how the new functions work. We provide points to consider to help you set up your storage cloud and integrate it into your operational environment. Part 3 shows you how we used the new functionality to communicate with the cloud and to send data and retrieve data from it..